Most sports fans have heard the old cliché that “you can’t win (fill in the blank) early, but you can sure lose (fill in the blank) early.” And while it does seem reasonable that a baseball team could lose any chance of a playoff appearance early in the season, the number of games required to draw that conclusion is much greater than the intuition of the casual fan. Everyone who follows the NFL, for instance, is aware that since 2007, only 10.8% of the 83 teams that have started 0-2 made the playoffs. Two. Just two games and you’re essentially toast. But the length of the season is radically different in MLB compared to the NFL. An 0-2 start for an NFL team represents 1/8th of their total 16-game schedule. The same fraction of an MLB team’s 162-game schedule is 20 games. It’s pretty hard to imagine a baseball team losing the first 20 games of a season. It’s so hard to imagine, in fact, that in the 115 years of “modern” baseball, it’s only been done once. In April of 1988, the Baltimore Orioles, managed by Cal Ripken, Sr. and later replaced by Frank Robinson, lost the first 21 games of the season. That Orioles club would go on to finish 54-107 in 7th place of the American League East Division. Most of baseball knew the Orioles were done long before the streak ended on April 29, 1988, in the old Comiskey Park against the Chicago White Sox. But, what about the other way around? Could hot starts to the marathon that is a 162 game MLB season translate into good fortune in October? The most consecutive wins to start a season is shared by the 1982 Atlanta Braves and the 1987 Milwaukee Brewers. Each team started off the season with 13 straight victories. After their hot starts, both the Braves and the Brewers played slightly above .500. The Braves went on to an 89-73 record, or 76-73 following the opening win streak, and won the National League West, losing in the National League Championship Series to the St. Louis Cardinals, who would go on to defeat the Milwaukee Brewers in the World Series. That 13-0 Brewers squad would go 78-71 the rest of the way in ’87 to record a 91-71 record that was only good enough for 3rd place in the AL East. The Detroit Tigers won the division with a 98-64 record and were trailed by just two games by the Toronto Blue Jays who went 96-66. Ninety-one wins would have won the West by 6 games. So, What Does All This Have to do with the Seattle Mariners? What we’ve learned is that yes, you can blow the entire season early, but it takes such a monumental effort that even bad teams hang around, especially now when ten teams make the playoffs. But, we’ve also learned that a hot start can really cushion a mediocre team (the ’82 Braves were swept 3-0 by the Cardinals and the ’87 Brewers had the misfortune of being in the Division with the two best teams in the League) and propel them to the playoffs or very near the playoffs. In the Mariners case, they didn’t come out of the gate like Justify at the Belmont Stakes, but they have managed to bank quite a few unexpected wins early. Coming into the season, Fangraphs projected the Mariners to win around 78 games. Prior to the final game of the Los Angeles Angles series and on the verge of ten consecutive games against the Boston Red Sox and the New York Yankees, (six of them on the road), the Mariners projected win total is 89.6 with a 67.1% chance of making the playoffs in some capacity – a 4% chance of winning the Division and a 63.1% chance of taking a wildcard – most likely the second one to then play one game against either of the aforementioned Sox or Yanks. Why have the projected win totals and odds of making the playoffs gone up so dramatically? Banked wins. Going into the day game against the Angels, the Mariners were 19 games over .500 with a 43-24 record. That leaves 95 games still to play. Let’s say the M’s go .500 from now until the end of the season, say even 47-48. That alone would produce a 90-72 record. Now it is fair to point out that with the exception of the Tampa Rays, the Mariners face the toughest schedule in the American League the rest of the way. (The difference is .521 strength of schedule versus .520 strength of schedule with the decimal representing the current winning percentage of upcoming opponents). 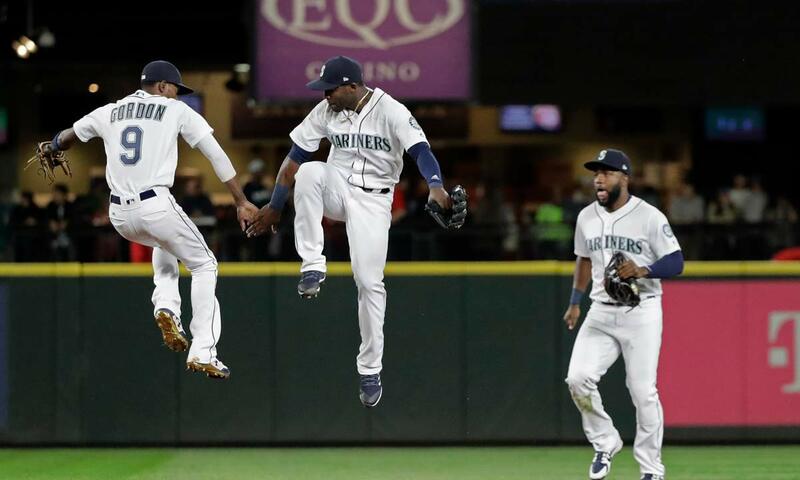 The Mariners still have 7 games against the Red Sox, 7 games against the Yankees, 13 more games against the Angels, and 12 more games against the Astros. But, on the other hand, they get to play Texas and Baltimore and Kansas City and AL Chicago too. With the Stanley Cup decided, the NBA Finals mercifully over, and the annual event of Bob Baffert training a Triple Crown horse is in the past, settle in for the Summer and a lot of good baseball. Mariners have a real reason for optimism. All because of those early banked wins.